My mother still has our ROYAL , under its dust cover. I had an Olivetti similar to the one pictured...at the end of my undergraduate years it was FILLED with the detritus of thousands of erasures and the keys hardly moved. (I joke that the only reason I graduated from college was because of 'Erasable Bond paper) Most oiften, I'd forget to mark the paper two inches from the bottom (or if I did, I'd be typing so fast, I'd miss the mark) and would often only notice I was typing on the platen by accident. I'd wind up erasing for a half hour. If not for erasable bond I'd prolly have given up..actually it wasn't college that got me most of the jobs I held..it was the typing I took as a senior in HS - I hadda take typing because I sucked out loud in math and typing was the alternative to advanced Algebra & Calculus...when I arrived in my unit in Germany as tanker - the common thing I heard..."I see you graduated from college...that means you can type..How'd ya like to work for...???" I eventually wound up as the Battalion S-2 Clerk - in a nice waerm & dry office when my fellow tannkers were freezing their asses off in the cold of Germany...nowadays EVERYONE can type and I type with one hand - thanx to a stroke in 2002. 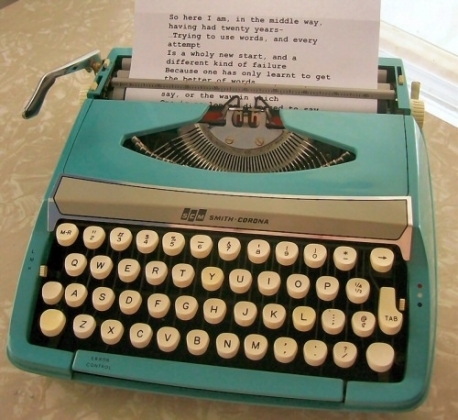 We had a Smith Corona portable like the one in the photo. Actually, my dad still uses it. I had an old Royal manual typewriter back in 1969 that was probably 30 years old. I miss their quality. My dad had a Royal portable when I was a kid, and later got an Olivetti electric for my mom.